It’s been a good year for making it back to dives sites that I haven’t visited in a long time. I hadn’t done much diving around the Firth of Forth in 3 or 4 years, so it was great to get the opportunity for a return to the Bass Rock and Isle of May. We were diving with Shadow Marine from Anstruther aboard Skipper Steve Haddow’s catamaran Mako. It’s a well equipped, roomy boat with a diver lift, toilet, Bauer Mariner compressor for air fills, hot drinks served in proper cups and posh biscuits! First stop was The Bass Rock, which is home to the largest single island gannet colony in the world numbering an estimated 150,000 birds. The Scottish Sea Bird Centre in North Berwick has webcams located on the island that you can check out here.. 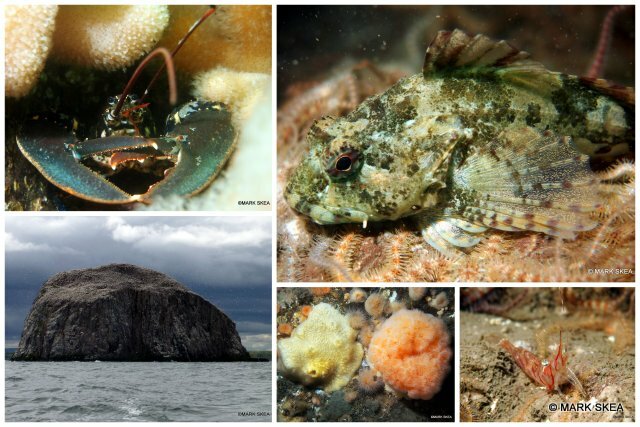 The Bass Rock is also home to a very nice section of wall covered in plumose anemones, dead man’s fingers and sponges. There were butterfish hiding out amongst them and prawns perched on ledges everywhere. Shining your torch in the nooks and crannies revealed lobsters, edible crabs, velvet crabs, squat lobsters and we also spotted a total of six wolfish. 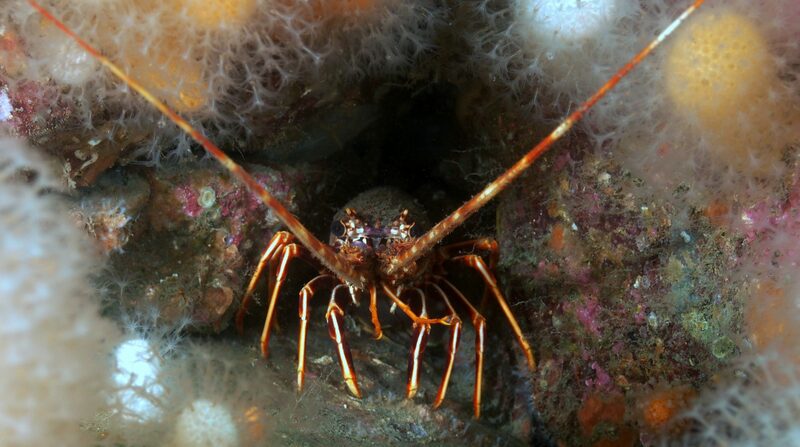 I can’t remember seeing so many of them on a single dive somewhere other than St. Abbs. Rather poorly I didn’t manage a single photograph of them as they were all wedged well in to their hiding places. Check out this previous post for some photos of their beautiful smiling faces. 😉 There was a very slight drift carrying us along the wall but nothing that stopped us from taking our time to have a good look around at all the marine life. It was just as good as I remembered, possibly a bit better. We surfaced after 50 minutes to the racket of sea birds overhead – the smell didn’t hit you again until you took your mask off! The wind had picked up a bit but getting back on board was quick and easy with the lift and we were soon on our way across to the Isle of May with a cup of hot coffee in one hand and a biscuit in the other. With our cylinders filled, the second dive was the wreck of The Anlaby. This was a steam cargo ship built in 1870 that ran aground only three years later on the Northwest side of the Isle of May. It’s fairy shallow with the majority of it lying in about 17m and well broken up. The exception is a fairly large chunk of the stern with a big four bladed prop still present, one of the blades embedded in the sand. We spent the majority of the dive covering the length of the wreckage and then headed off to explore amongst the large boulders slope along the side of the island. A seal zipped past as we were carrying out our safety stop and we surfaced after another 50 minute dive. More hot drinks and biscuits and it wasn’t long before we were back in Anstruther. With our kit packed away, we had a bag of chips from the Anstruther Fish Bar and sat outside to eat them. The sun even came out!